I wanted to see what other Jacksonville bloggers write about. It's mostly running, momming, and fashion/lifestyle. Real estate, art, and food are in there, too, but those end up being fashion and lifestyle, as well. Spellcheck doesn't think momming is a word, but mommying is really more of a helicopter mom thing. Another time we'll get into it. Also, almost all local bloggers are women. Men are too busy driving their big pickup trucks around town. I started to thinking that maybe what we need is a guy fashion and lifestyle blog. Or one about pickups. But I don't own a pickup. So fashion it is. I have a good camera, and there are all kinds of great photo locations in Jacksonville. I'm not good looking, but I can stand somewhere while wearing clothes as well as any man my age. I guess I'm also too old to be a male fashionista, or fashionisto. But it might be fun. I pull of the "I showered yesterday" look as well as anyone I know, especially when my hair gets big. I am going to have to study the basic modeling poses. I'll watch Zoolander again for inspiration. And since my wife will hate the idea, I'll have to use the timer on my camera. Or have my kids take the photos. A family project. Anyhow, we'll start with a photo of me in a Big Dog Glenn Robinson jersey. The photo is a decade old, and the jersey was a decade old in the photo. I still own it, and I wear it for special occasions, like helping people move. I like this jersey. It's comfortable and doesn't show sweat like cotton t-shirts, so it's back in the rotation here in Florida. 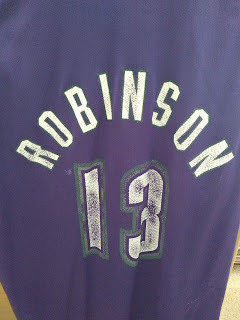 It has a better fit than my newer Ray Allen jersey, but my wife bought that one for me, so I have to wear it sometimes. 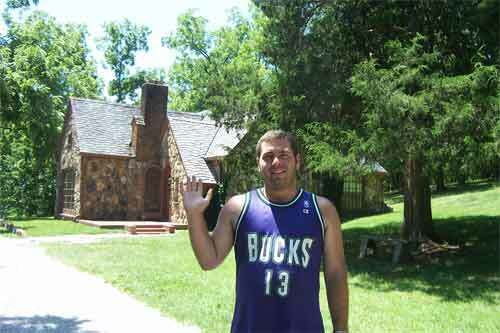 If I had a Blake Bortles jersey in 2018, I might not wear it, but this #13 Milwaukee Bucks jersey is classic old-school from a winning team. I think I'm at Laura Ingalls Wilder's house in the photo. If I'm going to get dragged to a tourist attraction like this by my wife, I'm going to wear a comfortable shirt, especially in Missouri in the summer. I think that's part of the fashion blogs I saw: going on location for photo shoots. That's awesome because I love locations, but it will probably mostly be in my back yard. I could stand in front of the post office when I go to mail some letters, too. This male fashion blogging is going to be sweet.